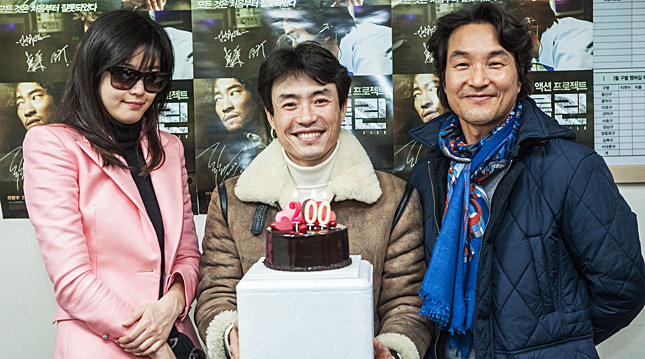 Director RYOO Seung-wan has hit number one at the box office with his latest film. The Berlin File brought in 1.53 million admissions in its first weekend, marking a new chapter for the Korean spy action genre. The film surpassed the two million mark in the shortest time among films that were released in January and February this year. The rate is similar to that of BONG Joon-ho's The Host and CHOI Dong-hoon's The Thieves, which are the all-time number one and two most popular Korean films. Officials from CJ Entertainment say The Berlin File is a hit with audiences among all Korean films released this year and its popularity will likely increase thanks to the Lunar New Year's Holiday period coming up. Meanwhile, Miracle in Cell No. 7 is rewriting the human comedy genre, drawing in 4 million in 12 days since release. The film drew in 15% more audience members compared to its first week despite The Berlin File being released. As of February 2, the film booked 75.8% of itsseats, which is slightly higher than 73.8% of The Thieves in its first week, raising expectations for the film to become a long-time favorite. The figure is higher than the second week Saturday scores of A Werewolf Boy in its second week (530,000) and Masquerade (490,000).